How I praise and thank You Father, that You know the inner thoughts of my heart, and the areas within that need Your refining tool and cleansing touch. Forgive me for the mask I so often wear and the carefully designed pretence that prevents others from seeing my true self. 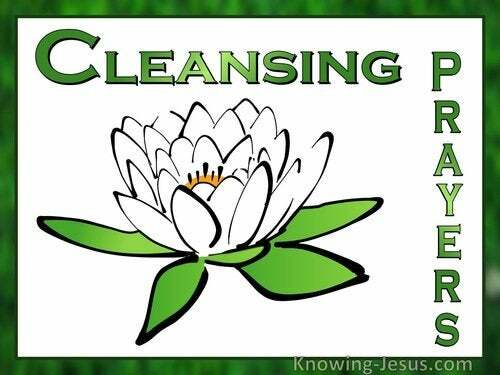 Lord You know my heart, and the motives behind my thoughts.. and I confess that I need Your inner cleansing. Create in me a clean heart oh Lord, and renew a right spirit within me, I pray. For too long Lord I have lived a lie, by hiding a range of inner hurt and damaged emotions behind a smiling face – when my heart is bitter, unforgiving, angry and full of pain. Change my heart from the inside and heal these hurts I pray. Remove all the offensive impurities within, that are so offensive to You.. and fill me with Your peace and Your joy, so that in spirit and in truth, I may show forth Your love to others. Thank You Father that though my sins were crimson, the blood of Christ has washed them white as snow. Thank You that though my sins were many, they were placed on the spotless Lamb of God, Who took the punishment I justly deserved - and unworthy though I be, thank You that I have been clothed in Christ’s perfect righteousness, and declared justified, in Him. Thank You that the Lord Jesus was prepared to be identified with my sinfulness.. so that I in turn might be identified with His glorious righteousness. Father I recognise how much you have done for me, as a free gift of grace.. and ask that You continue to examine me, and to cleanse me from all unrighteousness. I pray that You would do away with all my self-will, my passion and my pride - and purify my heart I pray. Lord I have grieved Your Spirit and have lived and unholy and unrighteous life-style and I am not worthy to be part of Your family. But Lord, according to Your loving-kindness and tender mercies I pray that You will cleanse me of my sin and wash me white as snow, in the blood of the Lord Jesus, my Saviour. Lord I acknowledge my sin and my rebellions ways. Loving Lord Your Word has promised that if I confess my sin You are faithful and just to forgive me and to cleanse me from all my unrighteousness. Lord I do confess that I wronged You in so many ways - and pray for Your forgiveness. Heavenly Father, we confess the sins of the Church, both individually and collectively for as Your Body we have not loved You as we ought nor have we followed You as faithfully as You desire. We have sinned and done so many wrongs and often acted in prideful and rebellious ways – and have not paid heed to Your righteous instruction. Lord as Your Body on earth and as ambassadors of heaven we have not kept our garments spotless.. but have gone our own way and followed our own desires and impulses.. and there is no health in us - and we are ashamed of the filthy garments that, as Your bride we are wearing..
Look down on us in compassion and forgiveness we pray and purify our hearts and cleanse us of all our faults.. both individually and collectively. Father God, be gracious to me I pray, according to Your loving- kindness. Father, my sins are heavy against me and my soul is troubled.. for the many wrongs I have done against You and for the many evil thoughts and unholy attitudes I have allowed to influence my heart and rule my life, for far to long. I have sought to condone my wrongdoings, and ignore the voice of my conscience within.. and I ask Your forgiveness for my foolish pride, in ignoring the gentle promptings of Your Holy Spirit. Forgive me I pray, and restore to me the joy of Your salvation.. for You have promised that all who truly confess their sins will be forgiven and returned back into a right relationship with You - and cleansed from all unrighteousness. I Prayed For This Prayed for 709 time. Please God i feel empty confused and guilty for having wronged my wife. she now hates me and wants nothing to do with me. I still love her deeply and i do not know how to move on. I Prayed For This Prayed for 711 time.